There are lighting effects galore (some overdone, some mood-enhancing by Thomas Shorrock) in Slow Burn Theatre Company’s mostly commendable, high-flying production of Tarzan: The Stage Musical. It runs through Nov. 5 on Broward Center for the Performing Arts’ intimate Amaturo Stage. Fortunately, director/choreographer Patrick Fitzwater doesn’t forget to highlight the message at the tale’s core. Despite how different we seem (not only between fellow humans), we share more similarities than we may think. The desire for companionship, love and acceptance are common to man and beast, as the production touchingly illustrates. One of the most memorable moments from the 2016 Disney film version comes when Jane and Tarzan look at each other with wonder. It remains in the stage show and Fitzwater makes sure it sticks in our minds. The scene takes place almost in slow motion and an awed expression registers on the performers’ faces. Jane and Tarzan are trying to get a feel for each other, when suddenly their hands touch. An instant bond forms. They may come from “two worlds” but they’re all part of “one family,” as Phil Collins’ lyrics state. “Two Worlds” is one of the memorable and heartfelt songs from the Disney film and it remains in the stage show. It’s the beginning and ending song further reinforcing the story’s message of the similarities we share. Fortunately, “You’ll Be in My Heart” also remains part of the live musical. 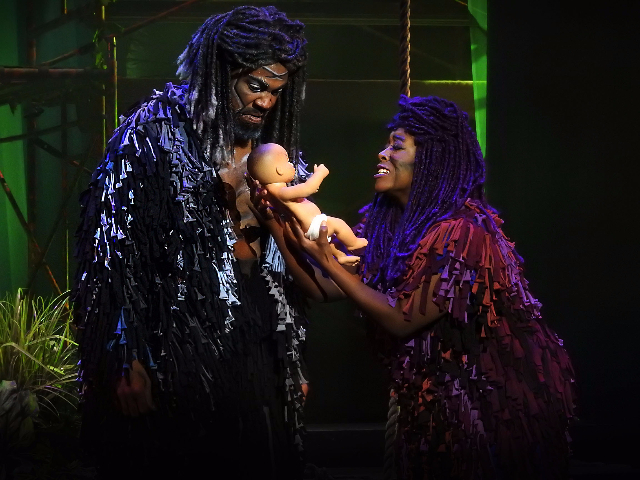 Mother ape Kala (a soft-hearted, loving Shonda L. Thurman with an emotional, expressive and strong voice) sings the reassuring melody with sincere-sounding tenderness to the infant Tarzan. His parents were able to place him on land before they were killed by a leopard. Tarzan is raised by Kala and her community of apes. That causes confusion and inner conflict within Tarzan between his animal and human tendencies. The duality of man (and beast) is another theme in Tarzan. This is illustrated through a smart directorial choice by Fitzwater. He’s instructed at least some of the actors playing apes, as well as the performer playing Tarzan, to walk on two feet at times, while during others, move on all fours. Also, their costumes suggest animals, but don’t hide the fact that they’re human. All of this reinforces the notion that we have baser, impulsive urges in addition to more human, rational tendencies. An inner tug-of-war between these tendencies forces Tarzan to question his true identity. As the title character, Natale Pirrotta makes Tarzan’s inner struggle palpable and relatable. At times, his high flying Tarzan acts like a beast, jumping up and down, acting on impulse and making nonsensical noises that make you want to cover your ears – and laugh. But there’s also a sincere and gentle aura surrounding this “ape man” that endears us to him, making us laugh with him, not at him. We’re further moved to pull for him as Pirrotta convincingly conveys this creature’s bravery, curiosity and indomitability. It helps that child actor Christo Joseph Amygdalitsis endows young Tarzan with similar convincing characteristics, making us believe he will grow into the brave adult Tarzan. Christo, who is making his professional debut, avoids playing too cute or showing off. But in Young Tarzan’s solo, “I Need to Know,” the youngster’s voice needs to betray more vulnerability and sadness. Toward the end, Christo sings a reprise of the song with more genuine pain emanating from his voice. Young Tarzan sings the song to express his feelings after Kala’s mate, the male ape Kerchak (a fiercely protective, commanding and sometimes austere Dante J.L. Murray), ostracizes him from the community of apes. The song brings to mind “Where is Love” from the musical Oliver! In both songs, a lonely child begs for acceptance and love. Speaking of Oliver!, Tarzan’s composer/lyricist Collins played the Artful Dodger in the 1964 London production of Oliver! Collins, a legendary British vocalist and composer, was a child actor but lacks much experience writing for the musical theater. It shows in Tarzan, with his often bland, non-descriptive and repetitive lyrics. Some of the music is appropriately up-tempo, but a vibrant live orchestra (sometimes too vibrant) makes it hard to understand some of the lyrics. You're one of a kind, I can't explain it. You're kind of cool, in a wonderful way. The song does help define character, in this case Tarzan’s sidekick Terk (a wise-cracking, fast-talking, self-centered Darius J. Manuel). Some characters don’t need songs to reveal who they are. That’s especially the case with the human villain Clayton, who is more beastly than any of the “beasts” among the ape community. He’s part of an English research expedition to Africa to study apes. But Clayton (an insensitive, sinister Michael Cartwright) has more of an evil intention. Clayton stands in marked contrast to Jane. She’s a young researcher who has come with her father, Porter (a kindly, optimistic Michael Kreutz) to study apes. Clayton has also tagged along. 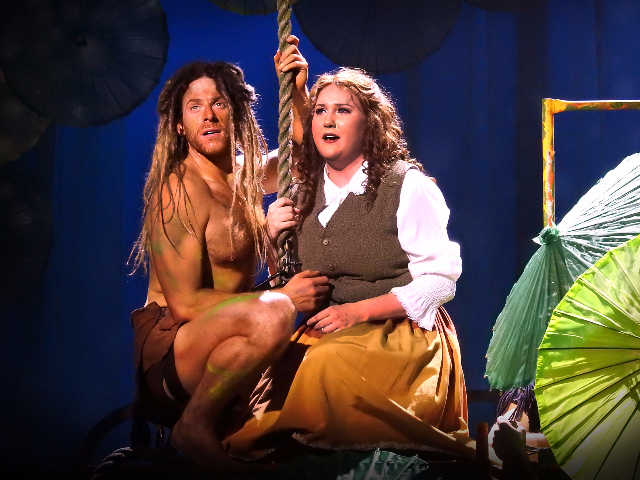 There’s a touching chemistry between Jane (a proper, sensitive, adventurous Lindsey Corey) and Tarzan. The conflicts that arise as a result of their fondness for each other make us emotionally invested in this couple. Their relationship is not unlike that between Belle and the Beast in another famous Disney show. Tarzan: The Stage Musical sometimes feels too derivative of Beauty and the Beast…and even a reverse My Fair Lady, with Jane standing in for Professor Henry Higgins, albeit a much less smug civilizer. A stigma often attached to Disney shows on the musical stage is that they’re more like over-decorated theme park attractions. That’s not the case with Slow Burn’s production of Tarzan. With the exception of the overdone lighting, it takes a less-is-more approach, letting us focus on the characters and relevant themes. 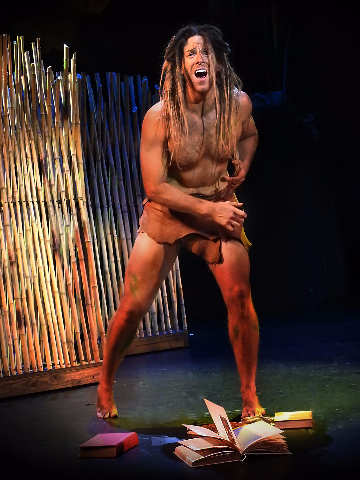 Tarzan: The Stage Musical continues through Nov. 5 on the Broward Center for the Performing Arts’ Amaturo Stage. Ticket prices range from $47-$60. For show times and tickets, call (954) 468-3280 or visit www.slowburntheatre.org.